In order to achieve the best quality of wafers with regard to purity, roughness and flatness and to reduce rejects, data is to be acquired from each machine and then transferred through Modbus TCP/IP to a central data bank were it is to be stored for statistical purposes. 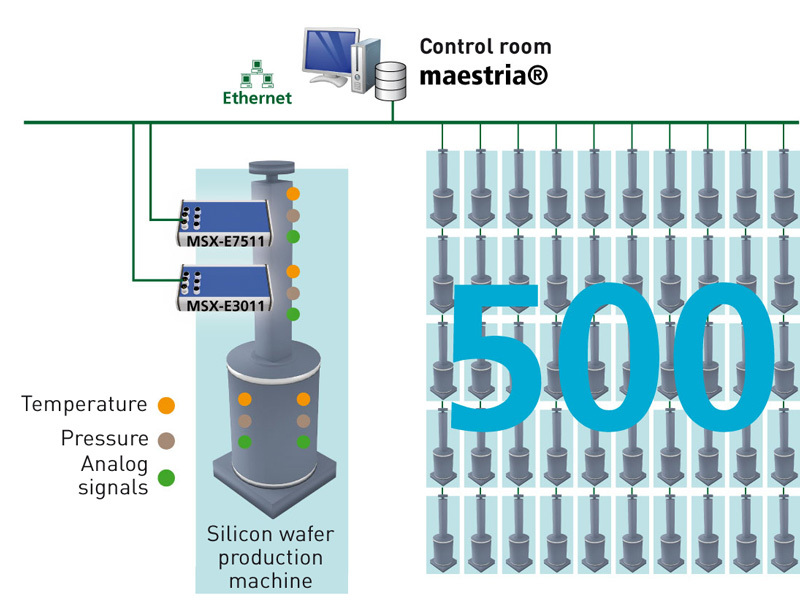 In a wafer production facility with more than 500 machines, 20 measurement points per machine are set up. Measurement data like temperature and pressure are to be acquired. The sensors are connected directly to the measurement systems. Two Ethernet systems acquire the sensor data: the analog input system MSX-E3011 and the system for serial interfaces MSX-E7511. Subsequently, the measurement data is transferred through Modbus TCP/IP to a Maestria® data bank.